Personlised hen do badges. 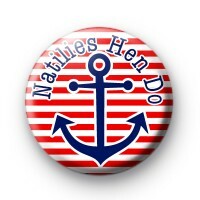 White and red striped badge with blue nautical anchor. Personalise with your own hen party slogan. Perfect for any sailor themed hen party. Just give us the text for around the badge in the box below.